The predoc school on cold atoms is organized each year in Les Houches in the continuity of a PhD program started in 2004 (*). The objective of the school is to give students starting a PhD in this field all the necessary knowledge on laser cooling, cold collisions or quantum gases for the success of their project. This year, the school will in addition cover the topic of interaction of light and cold atoms. The school will take place in Les Houches, September 30th - October 11th 2019. A preliminary scientific programme will be available soon. (*) Follow here for information about the previous session. This school is mostly intended for PhD students in the early stage of their graduate career. For instance, this would correspond to first-year PhD students in September 2019 for countries where the License-Master-Doctorate scheme is used, or second year graduate students in autumn of 2019 in the US system. Besides the main target group, a few applications from PhD students at a later stage in their graduate career could also be accepted. In this case we encourage the PhD supervisor to make a special statement in his/her recommendation letter. The school is opened to participants from all countries. Participants are expected to present a poster explaining their research objectives or achievements. Two dedicated poster sessions are organized during the duration of the school. Posters will remain on display for one week, in order to encourage spontaneous discussions between participants. All the lectures will be given in English. The number of participants is limited to improve the exchanges between students and lecturers. The school is opened to students of any citizenship. Applications must be completed on-line before June 30th, 2019. Applicants will be informed of the result of their application by the end of July 2019. Students will be able to apply in March 2019. You should prepare a short CV in plain text, and a paragraph (again, in plain text) explaining the reasons for which you apply. To be valid, your application should be followed by a written recommendation from your PhD supervisor. The recommendation should be sent by email to coldatoms2019[at]sciencesconf.org before June 30th 2019. Note that you should ask yourself for the recommendation email , your supervisor will not receive any direct request from us. Accomodation fees for students, PhD students and postdocs are 690 Euros (*). They are mandatory. Students are expected to reside in the school premises during the duration of the school.The fees cover full-board accomodation and lodging at les Houches school of Physics, from Septembre 30th dinner to October 11 after lunch. Please note that registration fees do not cover travel expenses. A few grants covering the registration fees (but no travel expenses) will be available. (*) Registration fees can be paid on arrival (credit card or cash). Les Houches is a resort village in the Chamonix valley in the French Alps. Established in 1951, the Physics School is located in a group of chalets surrounded by meadows and woods, at an altitude of 1150 m facing the Mont-Blanc range - a very favourable environment for intellectual activity in ideal surroundings for hiking, mountaineering and sight-seeing. The students have a permanent access to a computer room, meeting rooms and a library. For more information, have a look at the school website. The Les Houches physics school is a joint institute of Grenoble-Alpes University, ENS-Lyon, Centre National de la Recherche Scientifique (CNRS) and Commissariat à l'Energie atomique (CEA). The current director is Christophe Salomon. Tel: +33 4 50 54 40 69 - Fax: +33 4 50 55 53 25. 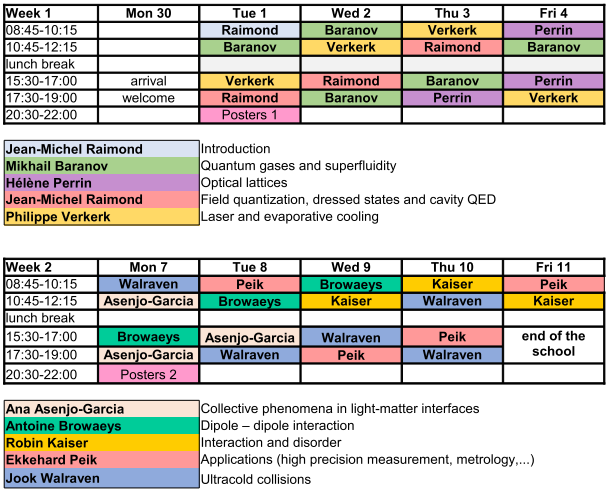 The Cold Atoms Predoc School program has been initiated several years ago by the International Cold Atom Network, INTERCAN, which is promoting European collaboration of research and education in the field of dilute atomic and molecular quantum systems. This program still contributes to the funding of the school. The program is now organized in the framework of the GDR Atomes froids, supported by the CNRS. The generous contributions of the Ecole de Physique des Houches and of the GDR IQFA from CNRS are gratefully acknowledged.